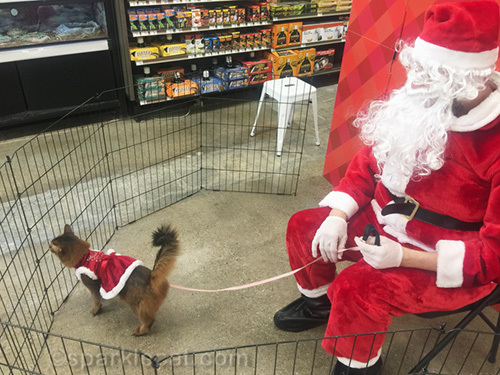 You are here: Home / Diary / I Met Santa Claws! I got to meet Santa Claws over the weekend! I will confess, it wasn’t the first time. My human and I tried before, when I was still pretty much a kitten (December 2015), and it was a disaster! I cried and did not want to sit in Santa’s lap and I thought he was weird and scary. But it has been a couple of years now, and I’m an experienced therapy cat. So I wanted to give it another try. Spoiler alert: it went a lot better this time! I really wanted to go this year because 100% of the $9.95 it costs goes directly to help local homeless pets through the Petco Foundation. Santa doesn’t get paid anything for posing with us. Maybe he even makes his own donation! 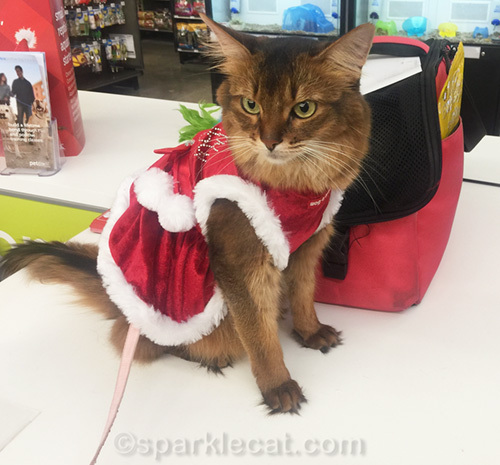 Anyhow, once my human paid and we got in line, I put on my favorite Santa dress. It says “Santa Baby” in rhinestones on the back. While we were waiting, I got lots and lots of compliments for my beauty and temperament! Plus my human brought some treats and did High Fives and paw shakes with me to keep me busy. I don’t know why people are always so impressed by that. Binga learned High Fives just by watching me do them. They are easy! It didn’t take very long for our turn. I actually didn’t feel much like hanging out on Santa’s lap, but I wasn’t scared like last time. I just wanted to explore more than sit around. I’m not really a lap cat. I will snuggle on the bed with patients, but that’s as far as that goes. Otherwise, I want to wander! Eventually I stayed on Santa’s lap long enough for a photo. Here is the picture! 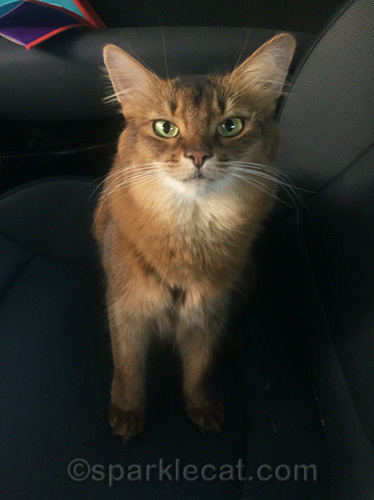 I think I look better than Santa doesÂ â€” I did tell him what I wanted for Christmas: for all kitties to have homes and for all the patients I visited to be well. I already have lots of stuff. 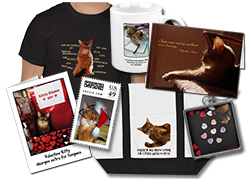 our Santa has a beard oopsie just like mine…hey, maybe they are the same, MOL, MOL! Oh, Summer, you are such a sweet kitty. What a wonderful thing to ask Santa Claws for. You look just adorable in your dress. Summer, you DO look better than Santa, but then you always look so wonderful! And your Christmas wishes rock! Can I use the same ones? Oh! Your picture with Santa sure turned out well, Summer! And your wishes you told him are the best. We’re wishing for those things, too! 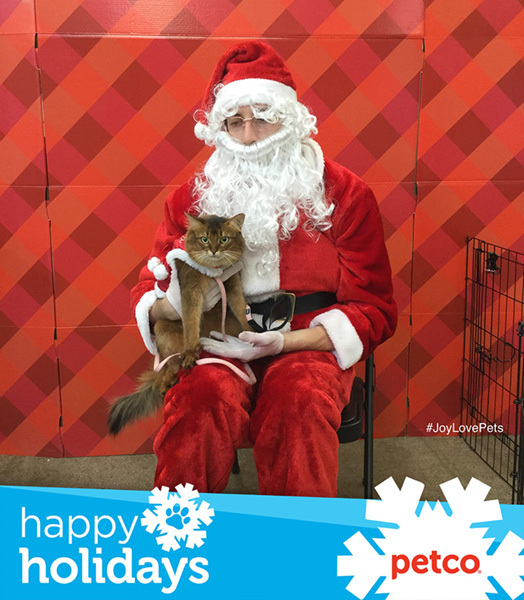 Oh my, you look so pretty, especially in the last picture (Happy Holidays, Petco). I CAN picture you riding along on Santa’s sleigh, and providing comfort and relaxation for the reindeer! Great job, Summer. You’re right about Santa – I think he needs to go to the groomer. His eyebrow whiskers are looking a bit crazy. HAH! You certainly did look better than Santa. He looks very frail and thin. In fact at first I thought he was a she pretending to be a he not that there’s anything wrong with that. Love that dress. I would be nice if you got your Christmas wish. You’re such a little doll, Summer. We hope your Catmas wishes come true. You and Waffles are just da bomb in your Santa outfits, and I love reading what you think about it. We hope your Christmas wish comes true, Summer! You are beautiful in that dress! We’re glad you weren’t scared of Santa this time either. Santa did look a little sleepy. You did a great job though Summer! No doubt about it who looks better in their Santa outfit…YOU do Summer! You do look better than Santa, Summer! I love what you asked Santa for, Summer! That’s our Christmas wish too. You look so pretty in your dress, and much better than Santa. Maybe he had a tiring day! You look so pretty in your Santa dress! Santa does look a little dejected, Summer. But we are certain you cheered him up and you do look as cute as a button sitting on his lap! Summer, we love your dress. That is terrific. And Santa does look a little worn out. But hopefully, you cheered him up. you looked adorable Summer and were so good with Santa to entertain others & then sit pretty for your photograph. 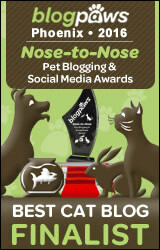 I hope that they raised lots of $ to help out pets who need a home. I agree you were better looking than Santa but all for a good cause. Summer the is for sure the cutest Santa Dress on the universe. MOLMOL an elevator button at the base of your tail OMCs that was funny!! Will you look at that, Santa Claws finally got a photo with the spectacular Summer! Oh my word but you are so fabulous in that dress! How bery cool and what a wonderful bunch of photos pretty Summer! We think that not all kitties were as well behaved as you Summer. Santa has the same look our human gets after she clips all our nails….only she has less of a beard, MOL! Still, it was very generous of him to visit with all the good puppies and kitties and we second your Christmas wish. Love your Santa photo. Have a great week. We are glad it went better this time, but we hear it’s not unknown for tots to be unsure about this Santa guy at first. You look awfully adorable in your dress. We agree, Summer, you look a lot better than Santa! He needs to age a little for a start!!! Your Santa dress rocks! You look great in Santa’s lap and we hope you get what you want for Christmas. We would like those things too. Good on you Miss Summer. We agree that you are much better looking than Santa. Great wishes too. We think that is the cutest dress and it looks good on you. Good that you were able to sit with Santa and tell him your wishes. You look stunning Summer. Santa may need a latte with extra caffeine.